Lounge / Dining Area Aspect 2 - 6.76m (22ft 2in) Into Bay x 3.63m (11ft 11in) Reducing to 11'2"
A spacious open plan living and dining area, having a wide angled bay window to the front elevation. Two wall mounted electric storage heaters. TV aerial point. Telephone point. Coved ceiling. An ample sized Kitchen fitted with an extensive range of contemporary white gloss fronted base and eye level units with chrome handles and work surfaces over inset into which is a 11/2 bowl stainless steel sink unit with mixer tap. Built in stainless steel fronted electric oven with matching four ring electric hob and extractor over. Integrated fridge freezer. Integrated dishwasher. Ceramic tiling to the return of the work surface area. A good sized principal double bedroom, having a UPVC double glazed window to the rear elevation. Useful built in double wardrobes. Wall mounted electric heater. Having a UPVC double glazed window to the rear elevation. Wall mounted electric heater. The Bathroom is fitted with a modern white suite with contemporary chrome fittings and comprises of panelled bath with shower mixer attachment. Also further additional thermostatic Aqua- Lisa Shower over. Close coupled WC with push button flush. Pedestal wash hand basin. Part tiled walls. Wall mounted electric chrome towel rail. Extractor fan. Electric Shaver socket. 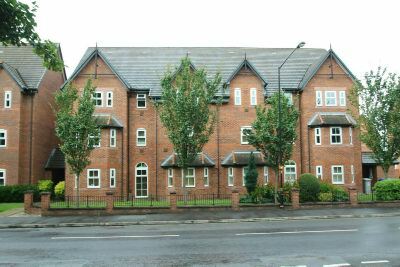 The development has well tended landscaped garden areas and there is a designated, numbered parking space to the rear of the development.